Research firm Canalys has released a new report with projections for smart speaker sales this year. It anticipates that the global install base for the product category will increase 82.4% from 114 million units in 2018 to 207.9 million units in 2019. The company forecast that smart speakers would have a larger audience than tablets by 2021. The report pegs the United States to remain the biggest market for smart speakers with a 42.2% share of the install base thanks to expected 46% growth. Mainland China is likely to lead the international growth rates at 166%. 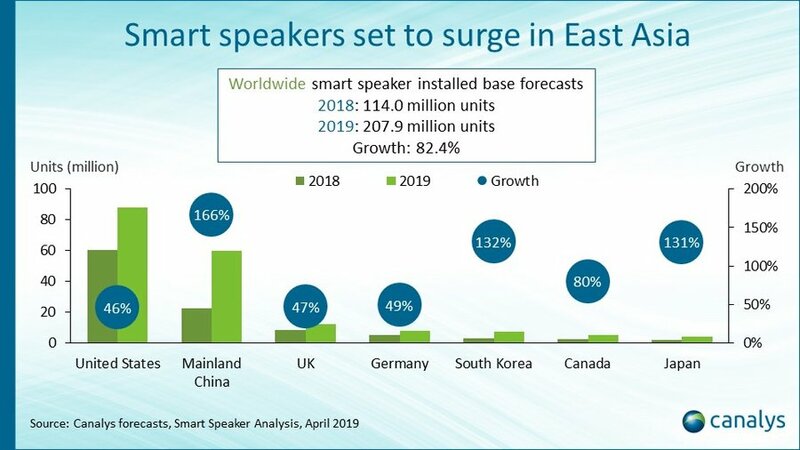 The number of smart speakers in the country are expected to rise from 22.4 million units in 2018 to 59.9 million in 2019. China could prove to be a compelling location for international tech companies, such as Google and Amazon, that have not yet launched in that already-active market. Other East Asian markets are projected to see strong increases in their install bases over 2019, with South Korea anticipated to grow 132% and Japan to rise 131%.